I came across an interesting fact about a dead jockey who won a horse race, which in turn reminded me of a poem I had posted in Bytes some years back. Both are worthy of a look . . .
By age 35, jockey Frank Hayes (1888-1923) had still never won a race. Truth be, he was a jockey second. a horse trainer and stableman first. In 1923 he agreed to ride a horse, Sweet Kiss, a 20 to 1 outsider, in a steeplechase at Belmont Park. Somewhere around the halfway mark, Hayes had a heart attack and died in the saddle. What is amazing, is that he didn’t fall off. Sweet Kiss kept running and Hayes kept riding, eventually crossing the finishing line and winning by a head. 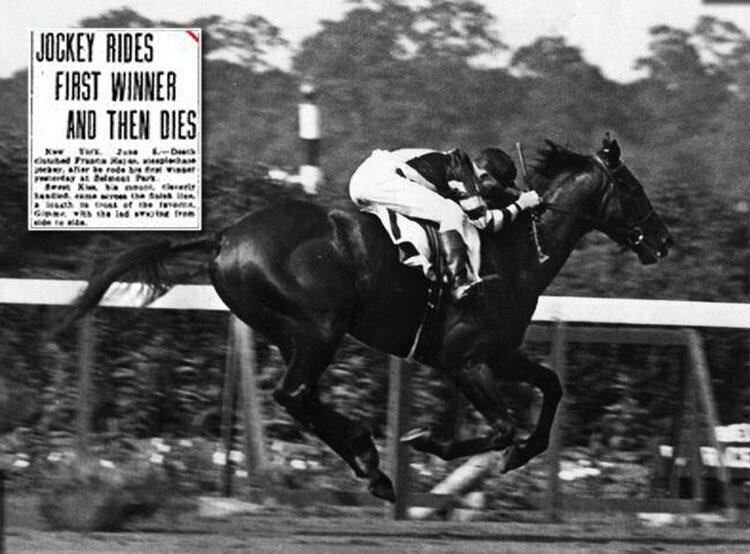 Hayes, still astride his mount, is the only jockey known to have won a race after death. It was only after the horse’s owners and race officials came up to Hayes, still sitting in the saddle, to congratulate him that they found out that he was dead. His first win and he didn’t know it. The horse never raced again and was nicknamed "Sweet Kiss of Death" for the rest of her life. His hand has never touched an oar. And hearkens to the swishing foam. Save those who live without the light. That scarcely seamed to heave. And vowed he heard him snore just now. His knuckle touched the dead man's brow. And never touched a reef. And hearkens to the foam. The dead who steered his blind son home.